← Do you think mathematically? Mathematical discoveries are not always birthed in the delivery room of revolutionary thinking. Often times, they are found in small interactions that emerge from casual conversations. Throughout history, the frontiers of mathematics have been riddled with concepts protruding from the foundation of humble beginnings. With this in mind, many mathematicians see collaboration, both small and large, as an important key to advancing their respective fields. This can readily be seen in the early part of the twentieth century. 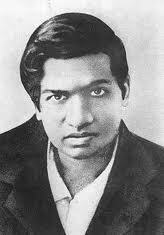 In 1914, the prodigious mathematician, Srinivasa Ramanujan, left his native home in Madras, India and traveled to the University of Cambridge in England at the invitation of two legendary mathematicians, G.H. Hardy and J.E. Littlewood. A year prior to his arrival, Ramanujan sent a letter to Hardy that contained a collage of mathematical notation scattered throughout the text. At first glance, Hardy dismissed the letter as gibberish. As Ramanujan pointed out, 1729 is the smallest number to meet such conditions. More formally, and . In honor of the Ramanujan-Hardy conversation, the smallest number expressible as the sum of two cubes in different ways is known as the taxicab number and is denoted as . Therefore, with this notation, we see that . Extending this concept a little further, a generalized taxicab number can be defined as the smallest number that can be expressed as a sum of a number of powers in $n $ different ways and is denoted as . For example, , since , , and is the smallest such number that meets the parameters given by , , and . Interestingly enough, no one knows what the general taxicab number, , equals for any . Even for the weak version, a solution has not been provided. In other words, if one removes the condition that the number has to be the smallest and we let , the question can be restated the following way: Does there exist any number that is expressible as the sum of two positive fifth powers in two different ways? So far, all attempts to prove the weaker version have failed. One possible attack is to produce an example computationally. Another method would be to prove or disprove its existence rigorously. In any case, don’t underestimate the effectiveness of good collaboration emerging from casual conversations. This entry was posted in AMS, Math, Mathematics in Society, Mathematics Online, Uncategorized. Bookmark the permalink.